'Meet the Locals He Tuku Aroha' is the result of a close collaboration between Isthmus and the team at Wellington Zoo. With over 5,000 people through the gate in the first weekend ‘Meet the Locals He Tuku Aroha’ is designed to give us perspective on ourselves, to push us towards an awareness of the diversity, mystery and beauty of New Zealand. Many parts are therefore interactive and designed for adults and children to learn through exploration and play. It’s a landscape that is intended to be used; kunekune pigs wallow in mud while children can jump in muddy puddles or forage for eggs. At the entrance to ‘Meet the Locals’, visitors cross into Penguin Point, an abstraction of the coastal landscape. 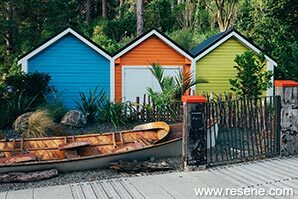 Reclaimed wharf timbers from the Wellington Waterfront and colourful boat houses are evocative of the city while the rocky landscape of native planting is home to the Korora (Little Blue Penguin). Pohutukawa Farm celebrates New Zealand’s strong ties to the land and the significance of agriculture. It highlights the interconnectivity of people, land and farming. Community vegetable gardens, kunekune pigs, sheep and chickens mix with play activities. The barn, a focal point within the farm, is a place for learning and interaction; it’s a hive of activity with sculptural bees buzzing around the roof space. As visitors leave the farm, the sights and sounds of an indigenous forest become more apparent, in this unique part of the zoo that’s nestled into the town belt out of sight from the city. Immersed in regenerating bush, visitors experience the interesting and distinctive aspects of indigenous species in their natural habitat, demonstrated through interactive conservation and opportunities to explore, build and play in the surrounding bush. The final stage of the project, Conservation Champions includes a walk through alpine aviary that allows visitors to enter the zoo’s first walkthrough aviary. Set among native flora, kea fly above, and interact with their environment. Within Penguin Point colours, Resene Danube (clear blue), Resene Clementine Orange (clean orange) and Resene Billy T (mustard gold), were chosen to evoke those found on the Wellington waterfront. The bright boathouses add a sense of uplifting splash of colour while the reclaimed wharf timbers, cappings and railings are painted using a more industrial palette, with Resene Thunderbird (racy deep orange) on cappings and Resene Fuscous Grey (charcoal grey) on railings. Within the Pohutukawa farm the barn colour, Resene Pohutukawa (spicy rich red), was an obvious one, chosen to both complement the existing Pohutukawa and as a twist on the traditional red barn. 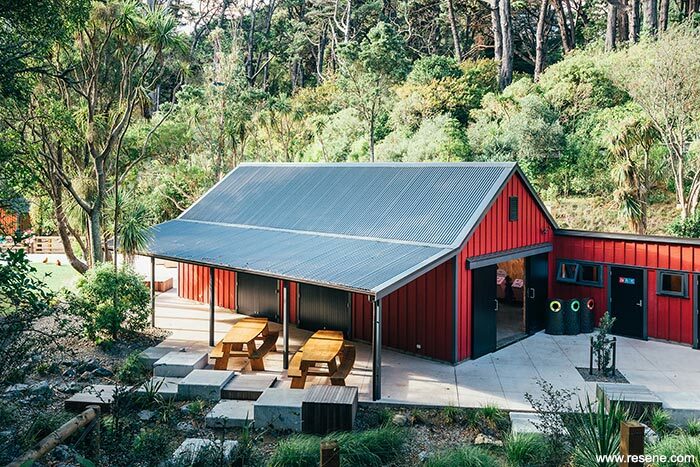 Other buildings were painted to unify the Penguin Point and Farm, and to ensure the space was bright and colourful, to complement the look and feel of visitor spaces throughout the zoo. The kunekune stable was finished in Resene Blaze (vibrant orange) and the sheep stable in Resene Dixie Chick (fun yellow) with trim colours of Resene Black (lamp black) and Resene Fuscous Grey (charcoal grey). Within Bush Builders the use of colour is a little more sparing, as the built environment gives way to the regenerating bush. As such the active vibrancy of Resene Hyperactive (frenetic orange) and Resene Monkey (deep walnut brown) were a perfect choice linking nicely with other play elements. 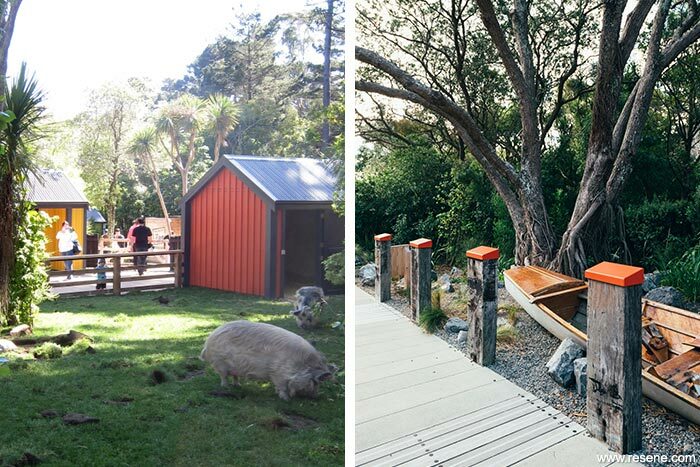 Without consciously choosing it, the zoo had chosen orange as a focal colour in each of the distinct sections of Meet the Locals He Tuku Aroha uniting the four spaces while allowing each of them to still retain an individual identity. The aviary welcomes visitors with Resene Woodsman Dark Oak (mellow brown) wood stain and farewells them with Resene Thunderbird. With thousands of visitors passing through, it was important that durable paints and coatings were chosen to keep the surfaces and colours looking their best. The project is protected by Resene Sonyx 101 semi-gloss waterborne paint, Resene Armourcote 221 brushing epoxy primer and Resene Armourcote 821 waterborne epoxy primer, Resene Uracryl 401 urethane acrylic undercoat/buildcoat and Resene Uracryl 402 urethane acrylic semi-gloss finish. Meet the Locals by Isthmus Group won the Resene Total Colour Landscape Colour Maestro Award 2016. The judges thought “when creating a new feature within an existing space, the challenge is even greater to ensure that the new has a personality of its own while still feeling part of the whole. This project cleverly embraces local iconic forms with colour to draw attention and give a sense of belonging. The playful theme encourages exploration and opens up visitors to being educated about our local living treasures. Architecture that could easily be hidden is celebrated with bolder colours, becoming part of the enjoyment of the space.